Here's a photo of the late radio host/opera commentator George Jellinek from his obituary in the NYTimes. I regret that I never sent him a thank you note for the decades of joy he gave my father and the wonderful childhood memories I have of both my father and the grammatically perfect and anecdotally rich radio shows of Jellinek. Great teachers of passion and obsession for music. It starts with my father. He endlessly played opera on a monaural tape recorder or a cheap transistor am/fm radio all day and all night in his little office in the basement boiler room of the home we shared with my grandmother and aunt in Brooklyn. 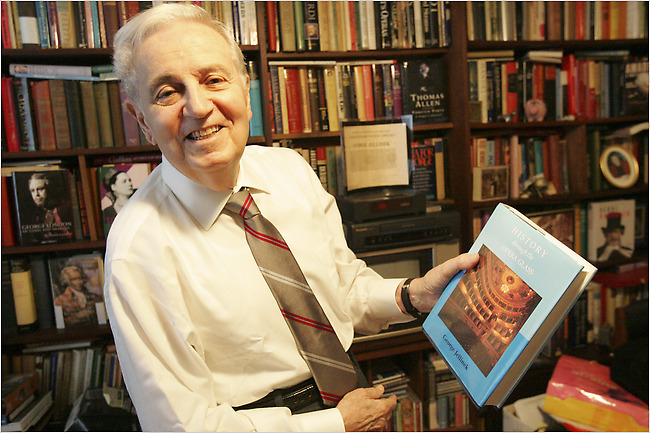 He had a voluminous library of scratchy tape recordings from WQXR's The Vocal Scene hosted by the now deceased George Jellinek who reigned supreme as the on air commentator for opera in NY from 1969 to 2004, when he retired. Jellinek spun recordings of the same operatic aria by different artists and overlaid the comparisons with insights, anecdotes, and despite a definite Hungarian accent, perfect grammar. My father spoke endlessly and passionately to me about the most minute differences between an aria recorded by Caruso and the same aria (perhaps Che Gelida Manina from Puccini's La Boheme) by Gigli or McCormick or Tucker. He desperately wanted me to fall in love with these recordings and artists and he waxed rhapsodic about the golden age of Opera, mourned its passing and glowed over the discovery of longed-for LPs in the Salvation Army stores and used furniture shops of Brooklyn where, for a dime, he could add a Marcel Journet or Tito Schipa to his collection. When, in 1994, he was dying of lung cancer, I spent hours a day in his hospital room -- and I can never thank my then and current employer, Lowenstein Sandler, enough for the gift of that much time with my father, especially since I was so junior a lawyer at the time and they gave me virtually endless time off to be with him -- 6 days a week for almost 3 months. Much of that time was spent discussing Opera, listening to it (they had just begun to release golden age Opera vocalists on CDs and I bought him a bunch) and sharing anecdotes about those singers and arias and various unfilmed (but much spoken of) performances of different operas. We also talked a great deal about books, movies, Vaudeville routines and, sometimes, the Yankees. He wanted me to share his passions and since men don't always have an easy time sharing emotions, we achieved an intense closeness through these shared interests. To tell the truth -- and he knew this -- I'd almost always rather hear Aretha Franklin sing Soul Serenade than a scratchy recording of Caruso doing Ridi Pagliacco (though that does rock). I think what's important is this: (1) I saw my dad's passion for music, (2) he shared it openly and freely with me, (3) we connected through it in a way that never could have happened without his openness about it -- letting me see his eyes fill with tears over a performance definitely taught me something about what being a man meant, especially in a pretty rough neighborhood in Brooklyn where my friends weren't listening to Opera, (4) his memory lives in me and is evoked by any mention of Opera or Mark Twain or John Steinbeck or H.P. Lovecraft or Sherlock Holmes or any of the things he held dear, (5) his love of anecdotes and the stories behind the music was infectious and (6) while the Opera thing never fully took -- I'm there...I'm totally there on the passion and on allowing myself to be brought to tears by a performance (sometimes humiliatingly so, especially on airplanes) and on questing for the stories behind the music I love (and sometimes falling in love with the music because of the back story). For one of those stories, check out this Youtube of the great Caruso and the wonderful Soprano, Geraldine Farrar from Madame Butterfly. More than 30 years ago, my father shared with me (and thank you Youtube for now confirming my rusty memory) this story. If you listen really closely Farrar, the Soprano, has replaced one of the lyrics (about 26 seconds in) with "He had a highball" (whiskey and soda) and Caruso, according to legend, replaces his reply lyrics with "No, I had three." I can clearly hear the first line, but am unsure of Caruso's reply - nonetheless, how lovely and unforgettable an anecdote, especially because my father told it with a zeal -- he felt as if he'd been let in on a secret and had forever more shared an inside joke with a tenor he worshipped...and he had. So the next time you hear me spout an overly verbose story about a bottle of wine, it's just because I don't have any Opera anecdotes to share but I sure do want to relive that moment in which I was communing with that wine and sharing something with that winemaker I worship. During high school I learned that a classic is something that has withstood the test of time. I've compelled my kids to immerse themselves in and absorb the classics. They don't need to love all of them. They don't need to agree with my list of them (well, at least, they can disagree with my list once they're paying their own rent). I do feel strongly that they need to discover, refute, embrace and create their own list of the classics. On reflection, it seems that my list of the classics isn't actually "works of art that have withstood the test of time" but rather works of art that have moved me and lodged themselves in my heart and brain so indelibly that I can't shake them. So, for instance, Jumping Jack Flash may be a gas, gas, gas...and every high school classic rock cover band I ever saw seems to have perfected a cover of that song. It is a really good song; it just never moved me the way that Mick did when he sang about the demise of his love affair with heroin, anthropomorphized in the song Angie which, to me, is a classic. Similarly, I know that Shakespeare's works are classics and should be read and understood but I've been moved much more deeply by To Kill A Mockingbird, even though Harper Lee really only appears to have written one transcendent piece of literature. Several years back (when I listened to terrestrial radio...generally left of the dial), I was listening to a college radio station and the DJ said that the next song was perhaps the best pop/rock song of the 1980s. He then explained that he'd give his right arm to be able to write songs like this one. I was stumped -- REM, the Replacements, U2, the Smiths, where was he going? He played "I'll Stop the World and Melt With You" by Modern English. Hmmm...save that right arm big guy! My point is he was clearly so moved by that song and it was important to him in a way that was very sweet although, in my self-satisfied view, misguided. But it did make me think. So I am defining "classic" as a blend of (a) has withstood the test of time and (b) I'd be really bummed if my kids missed these. My father's definition of classics in music differed pretty dramatically from where I am. It seems somewhat unimportant, however, because he'd have been very pleased with the degree to which I feel passionate about music...music that has been indelibly imprinted on my heart. And his quest for ten cent LPs at garage sales in Brooklyn, well that's pretty darn close to my endless quests for obscure bottles of wine everywhere I visit in person or on the web. Here's the start of my music list in case I'm gone and my kids want to know what I wanted music, books and movies I wanted them to experience...and, if possible, to love. Now that it's almost 20 years since my father Sam Zimmerman passed away, I sure do wish I could ask him what else I should be reading, hearing or watching. Let me know what makes your list...I'm off to find a recording of Jellinek that I can force my kids to hear, like my dad did so many years ago! High on my list, Ella Fitzgerald's classic -- Cole Porter was a frickin' Genius and Ella's voice is one of the greatest instruments ever created! Los Angeles Punk Rock Innovators, X, with their album Los Angeles set more than just the album cover on fire!